delivering 10 grams of total amino acids, our redesigned formula with electrolytes enhances muscle endurance during workouts and accelerates post-workout recovery. * it's a new age... for a whole new beast. Now with 10 grams of total amino acids including 5 grams of BCAAs, Aminolytes® is the perfect blend of amino acids and electrolytes for helping people to train harder then recover faster. Used during and after a workout, Aminolytes® increases muscle endurance, accelerates muscle recovery and repair, and maximizes muscle growth. * Formulated with the highest quality ingredients, Aminolytes® helps all athletes-professional or amateur—get big, strong, fit, and healthy. With this formulation upgrade, Aminolytes® is designed to bring that extra edge during training. Along with increasing the amino acid content to 10 grams, the ratio of the BCAA’s leucine, isoleucine and valine were fine-tuned to a unique 5:1:4 ratio. 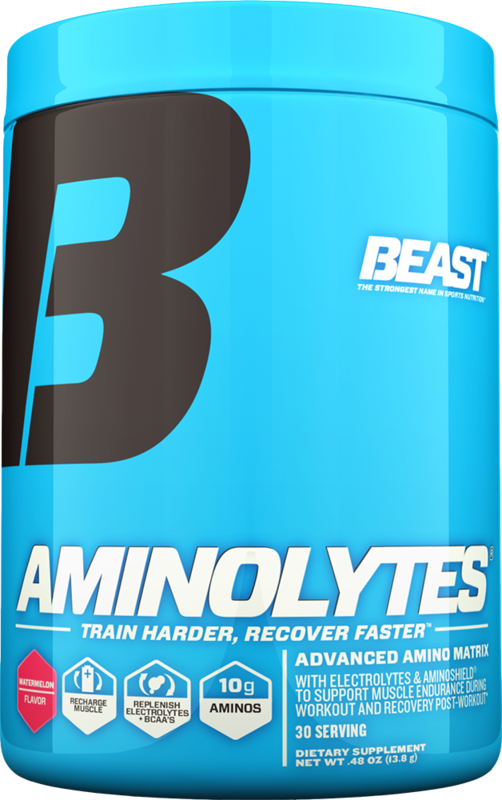 Packed with power, Aminolytes® will help you to train harder and recover faster.